What does your marketing plan include? What other revenue streams have you set up around your book's brand? Where Should You Spend Your Book Marketing Budget? Those resources will give you a primer on creating an effective book marketing plan and choosing the right tactics, budget, and schedule to make the most of your book sales. Today I want to focus on the second issue -- tying other revenue streams to your book in the form of ancillary products. In other words, let's talk about making more money from your books whether or not you increase book sales directly. An ancillary product is simply a product related to your book and its brand. Think of it as an add-on. You see ancillary products for movies, TV shows, and some bigger books on a regular basis (traditional merchandising). You can do something similar with your indie published books. Premium ancillary products can help you earn more from existing fans of your books. 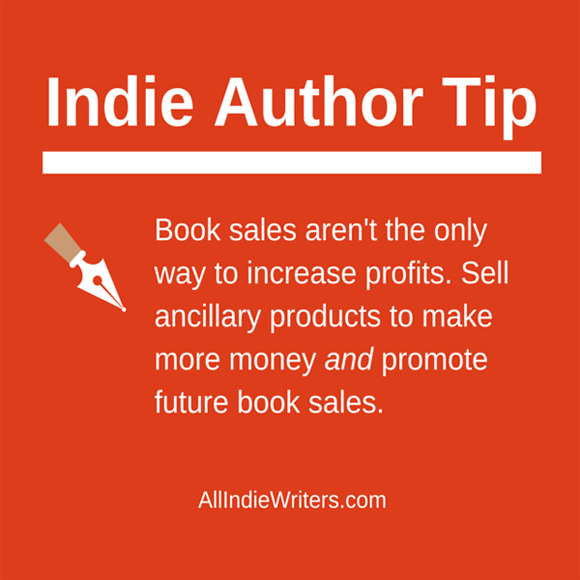 And low-cost ancillary products can be used as upselling tools and loss leaders to help you earn more from your books without having to give them away or price the first book in a series very low. The best part for readers is that they can find new things related to the books they love even in between stories -- they don't have to wait for the next book to get their fix. They can increase your income and help you get more mileage out of your book or author brand. They can promote sales of your existing book or future books by keeping your name or your book or series names fresh in the minds of your target audience. The financial incentive is pretty obvious. But think about that second point. You market your book. And you get paid to do so. It's similar to me telling freelance writers they should incorporate revenue streams into their marketing plans and platform-building (like niche blogs and e-books). If you can get more out of your marketing time, there's no good excuse not to. And in this case those additional marketing-oriented income streams can help tide you over financially while you write your next book. What's not to love about that? If you write nonfiction books, these might take a topic you touched on in the book and expand upon them (like a more in-depth tutorial). If you write fiction you might release short stories or novellas between novels. They might explore a subplot in more depth, they could be prequel stories about new characters you've introduced who sounded like they had an interesting past. Or maybe they could just be shorter stories about what your characters are up to between the times Novel A and Novel B take place. You could even come up with nonfiction downloads related to your novels. For example, if you write a series that revolves heavily around cooking and you feature recipes in the book, you might release a cookbook e-book with those compiled recipes and photos. If you write actionable books, you can also sell tools to make the process easier -- a workbook, access to specialized online tools and calculators, or something else along those lines. For example, if you write a book about planning weddings (or even a novel revolving around the topic), you could release your own wedding planner. This is one I'll be putting to use personally in a mystery series I'm working on under one of my pen names. The series happens to involve a certain type of party game, and I'm launching my own series of downloadable games tied to the books. You could create anything from a board game or card game to an app game or more traditional software if you can partner with a developer. I can see this working best with mysteries and children's books, but you could probably plan a game just as easily around any action-oriented book or characters. You might think of e-courses as services, but you can release them in product form too. That's the route I'm taking here, setting up self-paced courses with downloadable options as opposed to live courses. If you want to do something similar, create a members-only website (you can do this fairly easily with premium plugins and themes for a platform like WordPress). Then put your course material on that site. Only paying logged-in members can access it. You can also set up autoresponder email courses, or use a learning management system like Sensei or LearnDash for WordPress sites. The idea is to give buyers something they can access on their own time rather than a service-based approach where you have to physically be available and schedule each event for a more limited number of participants. You could also rely on good old fashioned merch to serve as ancillary products. This could be especially good if you write inspirational books. Coffee mugs, pens, t-shirts, and calendars are just a few examples. Think about any relevant product that could rock your logo or other brand elements, and ask yourself if it might appeal to readers. The idea is to look within your own book first. Do you mention a specific product a lot? Could you create something similar to promote and sell? Does your book have a message that people would pay for? Is there an educational angle you could use to sell information products? There is no one size fits all list here. Your books dictate the types of ancillary products that would work best for you. Do you sell ancillary products in addition to your books? If so, what products did you choose? Why? If you haven't yet, are you going to consider it or is there some reason you don't want to pursue the additional revenue streams and marketing options? What kind of success have you seen with ancillary products if you do use them? Share your thoughts, suggestions, tips, and stories in the comments below. Note: This is a revised and updated post, originally published on June 22, 2011. I’m a big fan of ancillary products as a consumer, so it is very exciting to me to plan them for my WIP novel series. I’ve got a few projects in mind for my vampire romance series. 1. A spell book – In my stories, vampires are slain both by physical violence and (by the pros) using a magical language to free the souls of the vamp victims. So the book will share phrases and offer slayage tips. 2. A relationship helper – For the ladies that look to date vamps for the long term (not all are *evil* in my storyverse or I’d just miss out on some many groupies / potential readers 😉 ) that offers some practical tips – like how to supplement iron without hurting yourself and the like. Just my first two ideas. I’m also looking to release short stories and even gear / merch if I find the right venue to work with…I’ve heard some less-than-great things about Cafe Press. CafePress has been around a loooong time now. They were the only go-to source back in my PR days (largely with indie musicians), and you could always tell when an artist had “real” merch vs CafePress merch. The quality just wasn’t there. Now that was in their early days, and I’d like to think they’ve improved a lot since then. I just can’t say anything about them from more recent experience. Maybe other readers have used them in the recent past and can give more updated feedback. I was on their site the other day for some reason and noticed the sky high prices haven’t changed. For that alone I wouldn’t use them. It just does’t feel fair to customers to make them pay ridiculous rates just so we can be cheap asses and not pay up front to release something professionally at a lower per unit cost. Just my $.02 on that kind of thing. Amen to that. Being in business means budgeting for the cost of doing business! The trouble that I’m having is determining where to sell the ancillary products. The book publisher gets the book to all the online outlets, do I get the ancillary products to Amazon? Or how can a consumer order a book + ancillary product in one place? I’d say to start selling on your own site first (especially if you’re talking about digital ancillary products). Not only should you already have a targeted audience there, but it gives people an extra incentive to order books and e-books directly from you too (cutting out the middlemen and increasing your cut on those sales). It also gives you the opportunity to experiment more with marketing strategies. And when you have proven sales figures it will be easier to get products into other outlets. Another good option for digital ancillary products is to start an affiliate program (I like E-junkie.com for things like this, but ClickBank can also work). Then other people essentially become a commissions-based sales force for you.